Karawatha Cottages B&B provides guests a choice of 3 stylish cottages (UNWIND, RELISH and PONDER). The elevated position in the heart of the Blewitt Springs area of the beautiful McLaren Vale wine region offers guests sublime views over the surrounding vineyards and ranges, with numerous cellar doors and 2 excellent restaurants only a short walk away. 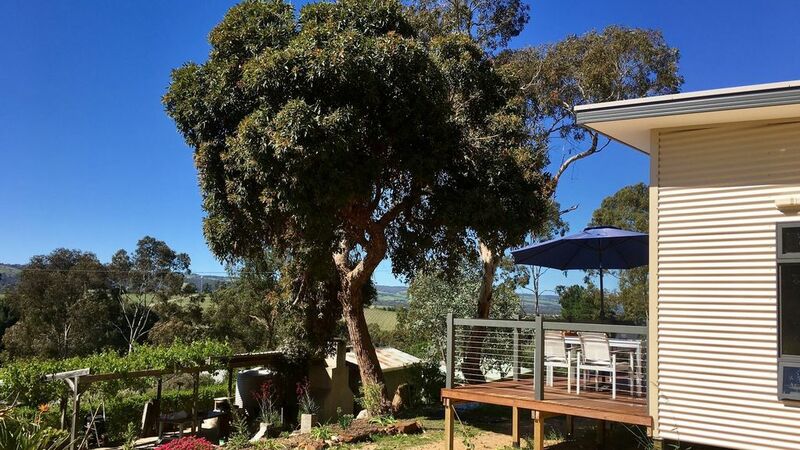 At Karawatha Cottages you will experience a calm, rural atmosphere surrounded by vineyards with the ever changing view of the Mount Lofty Ranges as the backdrop. Feeling Stressed? Relax and unwind on the deck of your own self-contained cottage, tune out to the sound of Yellow-Tailed Black Cockatoos, Adelaide Rosellas and the ever lovely sounds of Magpies. Quite the wine buff? Why not visit one or more of the many cellar doors in walking distance (Geddes Wines, Beresford, Woodstock to name just a few). Cannot bother to cook dinner? How about a delicious meal at the award winning Current Shed restaurant, which is just around the corner. Located in the picturesque Blewitt Springs area of the McLaren Vale just 40 minutes south of Adelaide, Karawatha Cottages provides the perfect place from which to explore the many local attractions of the stunning Fleurieu Peninsula. When booking for 2 guests, you will have access to 1 bedroom only. There is an extra AUD 50 per stay for use of additional bedrooms. Our full Terms and Conditions and cancellation policy can be provided upon request and are accepted upon payment of deposit. Spending 25+ years in the corporate world, it was time to make a true 'sea, tree & wine' change - leaving Sydney behind and choosing McLaren Vale as our new home. McLaren Vale is unique amongst all the Australian wine regions, offering easy access from a capital city, being along a stunning coast line and yet, being surrounded by the Mount Lofty Range, being being easy to explore. Settling on McLaren Vale for our tree change was the easy part - finding the right property was way more difficult and it took us about 4 years to find the perfect place. We looked for something that encompasses the beauty of McLaren Vale, showcases the hills, the vineyards, has easy access to cellar doors, restaurants - but is far enough away from the township and main roads south that it is truly rural and the only noise you will hear is the birds. We stayed here for a weekend escape to enjoy the region's wines and just chill out. This was the perfect venue, the cabins are modern, well equipped and very comfortably furnished. Our bed was very comfortable and our hosts delightful. We will return without a doubt.